A SURPRISING RECONCILIATION between exiled Donegal footballer Kevin Cassidy and manager Jim McGuinness could be on the cards. The relationship between Cassidy, McGuinness and the Donegal panel has been frayed ever since, with Cassidy publicly criticising his team-mates for their lack of support. But speaking on TG4′s Seó Spóirt last night, the Gweedore man suggested that he would be willing to put the incident behind him and return to the fold if McGuinness wanted him back in the panel for the forthcoming season. Cassidy won an All-Star last year as he helped Donegal to a first Ulster Championship since 1992 and an All-Ireland semi-final and moves in favour of his recall appear to be gaining momentum. Writing in the Donegal Democrat, former Donegal manager Brian McEniff supported the idea, saying that it is his “fervent wish to see Kevin back in the green and gold” in 2012. Email “Cassidy won't rule out Donegal return”. 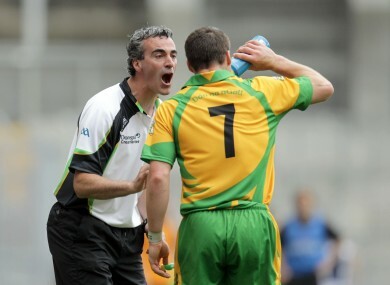 Feedback on “Cassidy won't rule out Donegal return”.